is enough to throw anyone off balance. The alarmingly red bloom in this Alabama pond started out as a green mass under the surface of the water earlier in the year. Slowly through the summer, it rose higher and higher, and started to take on a redder color each day. Looking at the picture above, you might think that it was the result of some horrible April Fools’ Day joke. What is this bizarre substance? It’s the alga Euglena: one of the most defiant single-celled organisms you’ll ever meet, and not just when it’s staining your pond a punk-rock red. It frustrated early scientists who tried to categorize it as either plant or animal. After going back and forth for years, scientists eventually just created a whole new kingdom to classify Euglena and its rebellious protist buddies. And this tough alga will frustrate you too when you try to kick it out of your pond. There are many species of Euglena, but the kind that interests as is the kind we find infesting ponds and lakes like the one above. This color-changing bloom is made up of single-celled protists that are remarkably versatile and covered by a flexible but tough protein pellicle. And while the pellicle itself is a good form of defense against the elements, Euglena also releases granules from its center that form an even harder shell to protect it when necessary from sun damage. This produces that bright red color. In fact, Euglena can react to increasing light and change from “open” green to “closed” red in less than 10 minutes, which is very cool to watch, but only when it’s not covering your entire pond or lake. Basically, it all sums up to the fact that Euglena is ready for just about anything you throw at it. Which wouldn’t be a problem if it helped out around the pond, but not only does Euglena not pay rent, it also eats up all your good algae and does nothing to support a healthy aquatic environment. Really this big red bloom is trouble, but getting rid of this red mass in your water is easier if you understand what drives it. spreading out in the cells. Remember when I said Euglena was versatile? This is where it becomes a bad thing. Euglena, like most algae, gathers sunlight and uses photosynthesis for food. The common treatment for the customers who shy away from harsh chemicals would be a pond dye or cover. But unfortunately those wouldn’t work out so well. The reason relates to why scientists couldn’t decide if it was a plant or animal: as soon as you cut off Euglena’s supply of sunlight, it will happily stop photosynthesizing like a plant and just start hunting around like a lion on the Savannah for other organisms to eat, like your green algae. 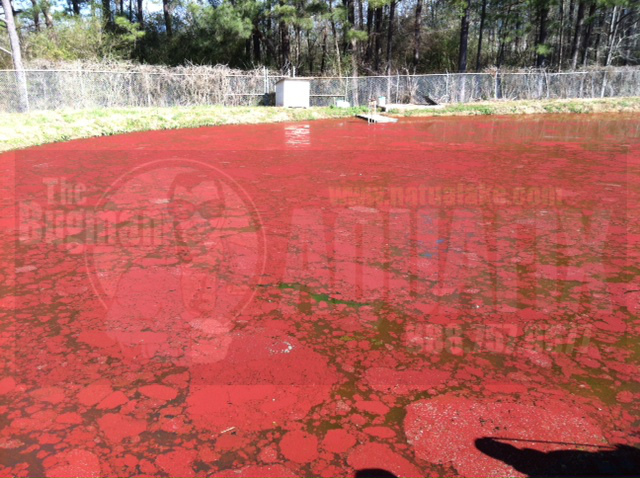 Even with customers who don’t have a problem with algaecides, red Euglena proves to be tough. The pigment granules have to be strong enough to withstand the radiation of solar rays, which makes them resistant towards algaecides as well. As we suggested for the Alabama pond from the picture at the top of the page, it is better to treat Euglena when it’s green and more vulnerable, which usually means the early morning before the sun has come up and Euglena puts on its radiation shell. We also know that it prefers a pond or lake which is high in BOD, organics, and muck. While those levels are high, you may be able to kill Euglena but you won’t be able to keep it away for long. Like the unwanted houseguest who doesn’t pay rent and eats all your beneficial algae, it’ll keep coming back as long as the door is open. After killing the Euglena with an algaecide, we would shut the door and help the balance of the pond with MD Pellets and Nature’s Blend; two products which will reduce organics and BOD as well as promote healthy beneficial bacteria. Being able to kill pond and lake problems is important, but in our business we make sure applicators don’t have to revisit the same water and the same problems over and over. Just like a healthy body can better fight illness, a healthy pond can make sure Euglena never becomes a problem.